New research recently released by Rutgers University, with support from the National Park Service and NTCIC (the National Trust’s for-profit subsidiary), is relevant to what might be thought of as a strange mix of bedfellows: history buffs, millennials, and tax credit advocates on Capitol Hill. To show where these identities collide, let’s start with a story about the Coke Building in Paducah, Kentucky. 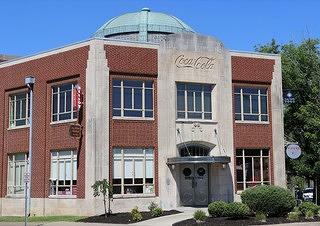 A Coca-Cola bottling plant, once owned and operated by a local family business founded in 1903, had sat vacant since 2005 in Paducah’s Midtown neighborhood. Its beautiful architecture caught the eye of Ed and Meagan Musselman, of Musselman Properties. Together with a skilled general contractor and a supportive city partner, the Musselmans finished a faithful restoration of the Coke Plant’s exterior facade and distinctive copper dome in 2016. The interior was reconfigured to serve restaurants, bars, offices a yoga studio, and more. Meanwhile, the building’s lobby was fully restored and features a Coca-Cola logo in its terrazzo floor, a cantilevered terrazzo stairway, and a hemispherical domed ceiling 45 tall and 30 feet in diameter. Upon its reopening in 2016, the Coke Plant now houses a diverse array of businesses, including a pizza restaurant, brewery, coffee shop, yoga studio, local artist collective, and office space for a marketing and web design firm. Federal historic tax credits (HTC) were critical to making the conversion of the Coke Plant possible, bridging the gap between what loans could be attained and what the rehabilitation would cost. Without about $1 million in federal and state historic tax credits, the project would not have provided enough of a return on investment for the developer to proceed. The broad strokes of this story—a once-proud icon of local history suffering from becoming obsolete or neglect finds a new, modern relevance through a tax credit-enabled rehabilitation—has played out in cities and towns across the country since the HTC’s inception. This type of activity is on the upswing nationwide, and it has tremendous cumulative economic impact—proven in the recently released Annual Report on the Economic Impact of the Federal Historic Tax Credit for Fiscal Year 2016. The report shows that 2016 was a record year for the use of the federal historic tax credit and the national economic impact it generates. Rehabilitation of 1,039 buildings was made possible by $1.2 billion in tax credits in 2016. HTC generated 109,00 jobs and $1.7 billion in federal state and local taxes. 2016 represents the largest year over year increase since 1986. Between 1978 and 2016 (the life of the HTC program), tax credit projects rehabilitated 42,293 buildings, created 2.4 million jobs, and generated $29.8 billion in federal taxes, which exceeds the $25.2 billion in credits allocated by the U.S. Treasury. Most of the revenue to the Treasury stemming from HTC-enabled projects comes from federal payroll taxes, paid by construction workers and manufacturing workers that produce construction materials. Most of the revenue is received by the Treasury before it pays out the tax credits at the end of the project—making it a relatively safe taxpayer investment. These statistics demonstrate that the HTC more than pays for itself and that most of the revenue is received prior to the allocation of the credits at project completion, which is a powerful argument as the Congressional tax reform effort ramps up on Capitol Hill—a process that is expected to intensify this summer. Both the Millennial and Baby Boomer generations are driving much of the growing demand for historic tax credits, and they can agree on at least one thing: they want to live, work, and play in authentic downtown historic residential and commercial spaces. It should not be lost that even with these favorable demographic and real estate market trends, developers consistently report that they still need the HTC to make these projects financially possible, given banks’ concerns about financing a project that carries the risks inherent in a historic rehabilitation—mostly, the unforeseen and sometimes costly quirks hidden within the walls of our nation’s historic churches, warehouses, theaters, department stores, schools, and more. Yet it is precisely these quirks that make spending time in places like the Coke Plant—or any of the other thousands of buildings that have been rehabilitated with the federal historic tax credit—so satisfying. Dig deeper into the numbers in the Rutgers Report on Preservation Leadership Forum, and learn how you can help protect and enhance them on our Historic Tax Credit page.